My trip to Australia and New Zealand is in full swing, which means that the time available for blogging is more limited than I would prefer. Even so, I will make a few observations here about a few interesting things that I have seen so far. Every time I travel abroad, I am stunned by the superiority of other countries' public infrastructure, compared to the U.S. At home, I am dependent on the Washington Metro, but I am becoming genuinely scared to ride those trains. Just in the last few days, as I have been riding on Melbourne's clean and extensive tram, train, and bus systems, The New York Times published an article describing a report from the National Transportation Safety Board (NTSB), which concluded that the D.C. Metro system was "making 'little or no progress' toward instituting a culture of safety," even after a fire-related death (along with 91 injuries in the same incident) on a Metro train last year, and several years after nine people died in a train collision a mile from where I then lived. The day after the NTSB's announcement, news reports indicated that Metro "will carry out months of extensive track work that will include partial shutdowns," which promised more disruptions like those caused by the one-day shutdown of the entire subway system a month or so ago -- a shutdown that was announced so suddenly that it caused universities, government offices, and businesses to close for the day. Then, to end the week on a terrible note, a section of the Blue, Orange, and Silver lines was closed yesterday due to smoke from a defective third-rail insulator. In the early years of this blog, after my first trip to Austria (not Australia), I noted in a column and a blog post the decaying infrastructure in the U.S. as contrasted with the infrastructure in countries with which we generally compare ourselves. As I noted then, we in the U.S. talk incessantly about our obligations to future generations, yet we squander the public resources that would improve their quality of life. In the years since then, more and more young people have decided that they prefer to live in urban areas, yet we have done virtually nothing even to maintain the infrastructure that exists, much less to improve it meaningfully. On a completely different topic, I should not have been surprised (although I was) that Australia is in some turmoil about refugees and immigration. There are, I have no doubt, plenty of Aussies who are as xenophobic as any Trump supporters in the U.S. Even so, I was impressed to see a poster campaign with the theme "Real Australians Say Welcome," which was started last year by an Adelaide artist and has gone nationwide. 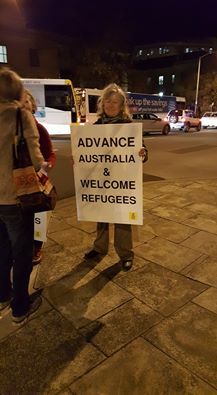 When we arrived in Hobart, Tasmania, we were delighted to see a small demonstration on a downtown street corner, with apparently prosperous middle-aged people holding signs like the one pictured below, as well as signs saying: "Honk if you support refugee immigration." The passing cars signaled a lot of support, and there was no apparent negative feedback. And speaking of Trump, Aussies cannot stop asking about him. They are terrified. When we boarded the connecting flight from Sydney to Melbourne on April 30, a young man in the next row heard our American accents and immediately wanted to know if we supported Trump. He apparently was trying to find out why Trump was so popular, and he had reason to think that random Americans on a plane in Australia might be good subjects for anthropological study. Finally, although I hesitate to pull a Tom Friedman and make a big deal out of a conversation with a taxi driver, it is notable that our cabbie in Hobart also wanted to engage in a lengthy (but friendly, of course) Q&A about Trump. For months, the world was apparently laughing along with American liberals (and even many conservatives) in thinking that this was all a cosmic joke. Why, they are now asking, do so many Americans actually support him? Although I do point out that Trump's general election prospects currently appear to be fairly dismal, the odds of his winning are far above 0%. What can I tell my gracious interrogators, who wonder how the United States has become the home to a party that would nominate a patently unqualified bigot to be President? Honestly, there is not a satisfying answer, and I am still working my way toward formulating something approaching a coherent explanation. As the trip continues, I will provide updates here on Dorf on Law regarding this and other issues. What about Trump's recent comments that America should borrow to its' heart content? Trump declared bankruptcy more than once. He figures the U.S. can as well. Would a constitutional amendment be required for America to file for Chapter XI? Regarding Trump's recent remarks about "negotiating" a reduction in debt, fear not, I am finalizing a Verdict column about that subject right now. Yes, Trump's idea is crazy, no matter what your political views might be. Nice to know you're still out there, Patrick O'Donnell! Your comment is fascinating. Among other things, it proves to me that my dabbling in philosophy must remain mere dabbling. That is, I can follow the argument, but I'm sure that I couldn't do that kind of work professionally!! I love Cohen's argument re compulsion, precisely because it shows how otherwise counter-intuitive the "free to choose" aspect of capitalism is. Milton Friedman must have freaked out. Your description of the quasi-compulsory voting system in SA, TAS, and WA sounds oddly like the "mandate" in the Affordable Care Act. You do not have to vote, but you have to pay to be excused from voting. I'm sure the people who found the "broccoli argument" in the U.S. to be persuasive would have a group heart attack about mandatory voting. Mitch McConnell, many years ago, argued that low turnout among poorer voters was proof that they are happy with the political system. Why force those happy folks to vote, when they're so satisfied with their lives already?! Yikes.